MORE big names fell in the Brisbane International yesterday, with fifth seed Sara Errani and sixth seed and former tournament champion Petra Kvitova both beaten. Daniela Hantuchova lost the first set to the Italian Errani, but fought back strongly in a match which featured an unusually high number of breaks of serve for both players - 14 in total. It was Hantuchova who held her serve when it mattered to record a 4-6, 6-1, 7-5 victory.Kvitova, who won the title in 2011, lost in straight sets to Russian Anastasia Pavlyuchenkova, 6-4, 7-5. 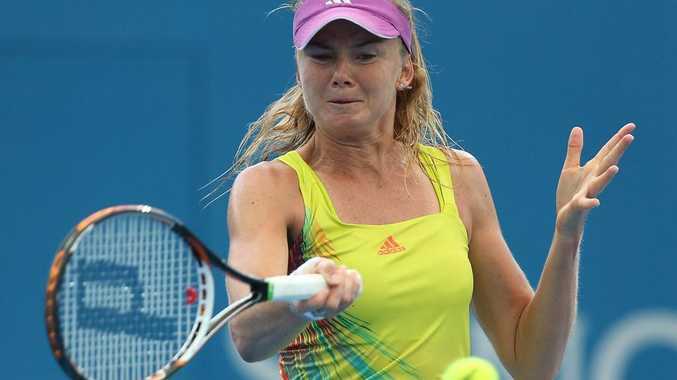 The Czech and Errani followed fellow early top name casualties Caroline Wozniacki and Sam Stosur out of the draw. Stosur lost in straight sets to Swede Sofia Arvidsson on Monday night. On the men's side of the draw, number 8 seed Slovak Martin Klizan fell to Denis Istomin of Uzbekistan in straight sets, and in a blow for local hopes, Australian Matthew Ebden lost to Belgian David Goffin 6-2, 6-2. Czech Radek Stepanek had to pull out of his match against Lleyton Hewitt last night due to an eye infection. "Lucky loser" Igor Kunitsyn, the highest-ranked final-round loser in the qualifying rounds, replaced Stepanek.